A Formula E/Division 250 cc Superkart at Castle Combe, England. Superkart is a form of motorsport road racing in which the class is a racing vehicle sized like a kart but with several characteristics more strongly associated with open-wheel racing cars. The most obvious difference between a Superkart and any other form of kart is that they have full aerodynamic bodykits and can race on car circuits over 1,500 metres in length. The power unit, most often, but not exclusively two stroke 250 cc engines, can be specially designed kart engines or production motorcycle engines with either five or six-speed sequential gearboxes. Owing to their high top speed and superb cornering ability, a Superkart's aerodynamic bodywork includes a front fairing, larger sidepods, and a rear wing. They use either 5-or-6-inch-diameter (130 or 150 mm) tires and wheels and most often race on full size auto-racing circuits. 250 cc Superkarts often[quantify] set faster lap times than much more expensive and technically advanced racing machines. Some British and Australian classes also include 125 cc gearbox karts. Superkarts race on "long circuits" (e.g. Silverstone, Laguna Seca, Magny-Cours). In the UK they also race on "short circuits" (e.g. Kimbolton), "short circuits" are under 1,500 metres in length. Superkarts are raced worldwide. There is a multi-event CIK-FIA European Superkart Championship (for 250 cc karts only), and there has in the past been a World Championship, which was last run in 1995. Powered by a 2-stroke 250 cc engine producing 62 hp for an overall weight including the driver of 205 kilograms, Superkarts have a power/weight ratio of 440 hp/tonne (330 W/kg)(c.5 lbs/hp). Superkarts can accelerate from 0 to 60 mph in less than 3 seconds with a top speed of 155 mph (250 km/h). Their low weight and good downforce make for excellent cornering and braking abilities. A Superkart is capable of braking from 100 mph (160 km/h) to standstill in around 2 seconds, and taking corners at nearly 3 g (30 m/s²). At some circuits, Superkarts are the outright lap-record holders, at others they run at around Formula 3 lap times. Division 1 is open to 250 cc karts with one or two cylinders and five or six speed gearboxes. Typically the karts produce 100 hp and are capable of 160 mph - the fastest form of kart. This formula was previously known as Formula E, which was changed to avoid confusion with the Formula E series. Division 2 is for single cylinder karts with 5 and 6-speed boxes. Typically these karts produce 65 hp and are capable of 140 mph. However, being lighter than the twin cylinder (Division 1) karts they can be as quick on twisted circuits. This formula was previously known as 250 International. However the main British series is for single cylinder 250 cc karts with 5-speed only, also known as 250 National. 125 Open - Powered by 125 cc engines and again featuring 6-speed sequential gearboxes, this sprint kart class uses lighter chassis than the 250's. 125 ICC (KZ) - Powered by similar 6-speed 125 cc engines to the 125 Open class with tighter tuning restrictions, this CIK sprint kart class hosts some of the closest Superkart racing in the UK. Superkarting in Australia has, since 1989, referred to any form of racing kart to race on full-size motor racing circuits, usually as sanctioned by the Australian ASN, CAMS. 250 cc International - commonly referred to as twins or inters, these karts are powered by twin cylinder engines and usually have 6-speed sequential gearboxes. Several European and North American chassis are popular in addition to locally developed designs. 250 cc National - single cylinder class, the 250 National class is powered by 250 cc motocross engines and also feature 6-speed sequential gearboxes. 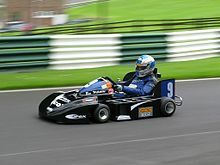 125 cc Gearbox - most often powered by 125 cc Honda and Yamaha Grand Prix motorcycle engines equipped with six speed sequential gearboxes, this Superkart class uses mostly the same chassis as the 250 classes. They run at lighter weights than the 250 classes, which makes for close racing with mid-field 250 Nationals at some circuits. 80 cc Gearbox - also dominated by Honda and Yamaha motor cycle engines, 80 cc gearbox Superkarts is no longer a sanctioned class in Australian racing. Some 80 cc karts were noticeably smaller than 125/250 cc gearbox karts, with 'laydown' style karts, where the driver lies flat in the kart rather than sitting upright, proliferating. Last contested at national level in 2005. and state level in 2008, some 80 cc karts survive racing in the 125 cc division at state level, but are uncompetitive as they no longer run at lighter homologated weight levels. 125 cc Rotax Max - a cross-over class from Australian short-circuit non-gearbox sprint kart racing to allow easier and cheaper graduation from Sprint karting to long circuit racing. Three national championships exist for two weight divisions, Heavy and Light, and also sometimes a Junior division for drivers under the age of sixteen which run a version of the Rotax Max engine without a power valve. Rotax Max karts frequently race amongst gearbox equipped Superkarts at state championship level, while racing for their own titles at national level. 100 cc Another non-gearbox class, 100 cc also was split into Heavy, Light and Junior classes, and was last contested in 2002 and has since been replaced completely by Rotax Max. 250 cc Formula/E or F/E - Twin cylinder, 6-speed, liquid cooled Grand Prix motorcycle engines such as the Honda RS250, Yamaha TZ250 or made for karting engines such as the BRC250. 250 cc Inter-Continental E or IC/E - Single cylinder, 5 or 6-speed, liquid cooled Grand Prix motorcycle engines. Road & Track reports Supercart to cost between $15,000 to $20,000 USD in 2005. Entries of 60 or more are common in Britain. Overtaking tends to be easy, as there is room to get past, so the races tend to be full of action. Race lengths tend to be around 20–25 miles (30–40 km), because the fuel tanks are quite small, so at most meetings which feature Superkarts, the karts race is often a brief, spectacular highlight (U.S. Superkart races are a timed 30-minute race; Pre-Final on Saturday, Final on Sunday). A global category, Superkarts are endorsed by the FIA, and were featured as a support category to the French Formula 1 Grand Prix at Magny-Cours in 2007 where they bettered Porsche Supercup lap times. ^ "Superkarts Australia: Superkarts Classes". Superkarts Australia. ^ a b c "2011 CAMS Manual of Motor Sport: Australian Titles" (PDF). CAMS. 2011. pp. 13–14. Retrieved 29 June 2011. ^ "2011 Australian Non Gearbox Superkart Nationals: Sporting Regulations" (PDF). CAMS. Retrieved 29 June 2011. ^ "United States SuperKarts - USSK". Archived from the original on 25 March 2008. Retrieved 18 February 2008. This page was last edited on 19 April 2019, at 06:38 (UTC).